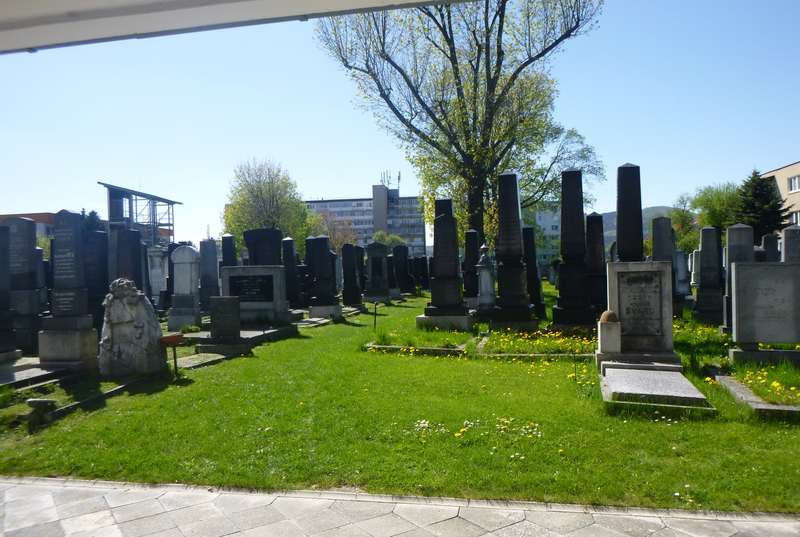 I visited the very well-kept Žilina cemetery in May 2017. 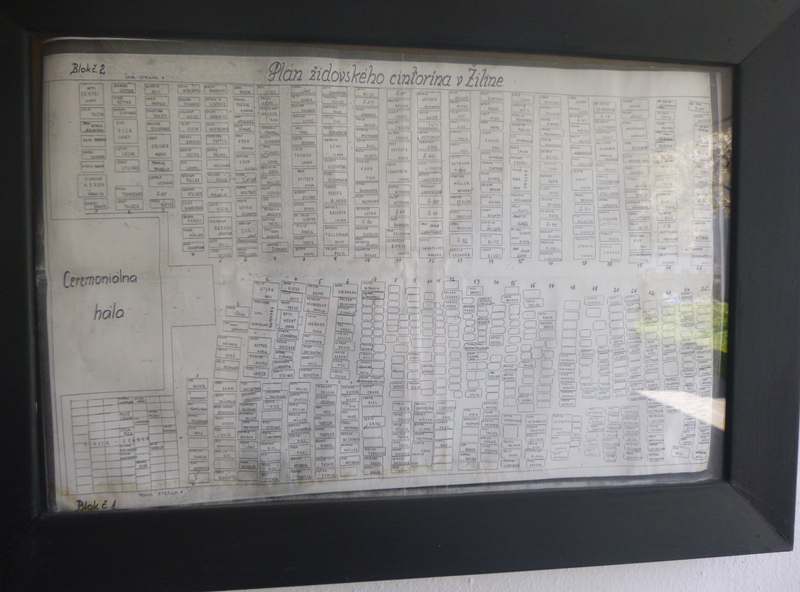 At the entrance are two framed maps of the cemetery, painstakingly hand drawn to scale, each grave listed with the name found on the headstone. This document is my transcription of these maps. The first map shows blocks 2 and 1 and the second map shows blocks 4 and 3. For the transcription, I’ve preserved the map order by block (2, 1, 4, 3). Then I have done each row, which all go from front to rear (left to right). 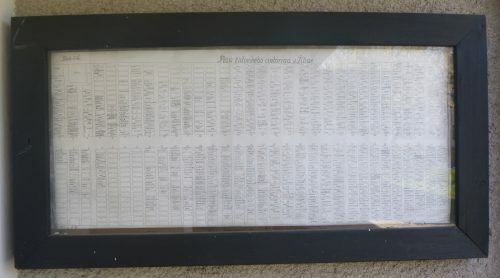 Within the rows, the transcription goes from top to bottom. I guarantee you there are errors. First of all, as careful as the mapmaker was, there are errors in the documents. Then there are my errors. Some are ordinary mistakes but others come because the maps can be confusing. Because the graves span a large period of time, there are differences in how names appear. In some, women’s surnames have “ova” on the end. In most, they do not. Some graves give the maiden name for married women and these may or may not be on the map, but aren’t indicated as such, so I had to guess (many women may be listed with their maiden names). Some women had no given names on the map (they may or may not be on the stones) but were “Pani” (“Mrs.”) with their husband’s names. 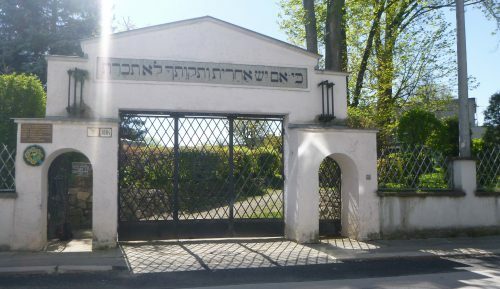 One common practice for stones made during or just after the Holocaust was to include the names of family members who died in the Shoah and could not be buried. The map includes these but it’s unclear at times which name is that of the person buried there and also which surname belongs to which given name. It’s clear on the graves but the map had limited space to work with. Some of my photos have blurry parts and some of the handwriting on the maps is unclear (though most is impeccable). Unfortunately, some of the graves are so old that the information on the stones is lost forever. A large percentage of graves have “not given” for the surname and/or given name. These were blank (or numbered) on the map. In some cases, the grave was not used but, for most of these entries, the headstones are just so worn that there is nothing left to read. I don’t know if the cemetery has this information in their books. Yes I did walk the entire cemetery while I was there. Mostly it’s easy to navigate with clear rows. In some places the rows are narrow and crooked and it’s not always clear which row a grave belongs to (my choices from those sections may not always match what the mapmaker intended, or what the cemetery records show). I took many photos, but only of graves with surnames from my family or those of my cousins who accompanied me on the trip. I have not matched these photos with the information the maps. My transcriptions are solely of the maps. If you’d like my original Excel document, it is below. Note the two sheets inside it, one for sorting by plot location, one for sorting by surname. 2 1 ARANYOS Etela Mrs.
3 28 AUERBACH Sara Mrs.
3 29 BERGEROVA Katarina Mrs.
3 31 FLESCH Kati Mrs.
2 11 FREIER Wr. Sam. 3 13 FRIED Dr. Artur Doctor. Shared grave (Dr.
2 20 FRIEDMANN Dr. David Doctor. Shared grave (Dr.
4 19 GLASEL Dr. Armin Doctor. Shared grave (Dr.
3 31 GLASEL Maria Mrs.
3 31 GOLDMANN Helenre Mrs.
1 23 HOFMANN Tani Fani? 3 31 KERNER Luiza Mrs.
2 19 KUX Dr. Wilmos Doctor. Shared grave (Dr.
2 5 LINDNER Nathan N.
3 28 MARKFELD Dr. Julia Doctor. Mrs.
4 2 ORVAN Dr. Eduard Doctor. Shared grave (Dr.
2 21 POLLAK Dr. Josef Doctor. Shared grave (Dr.
3 20 SCHLESINGER Dr. Emil Doctor. Shared grave (Dr.
1 8 SCHUSDEK Jakab Jakob? 4 15 TAUSINGER Maria Mrs.
3 14 WEIL Dr. Artur Doctor. Shared grave (Dr.
4 15 ZUANCIA Oskar Surname may be Weil.